Reading the news this morning, I came across multiple articles with such bogus claims that I feel compelled to rant about it here. All of the offenders (I stopped looking after 3 out of 3 all said the same thing) suggested that the overnight stock surge in Europe FOLLOWED the ZEW economic sentiment survey in Germany. Were stocks higher overnight? Yes! Was there an economic sentiment report in Germany from ZEW? Yes! Are the two things related? You tell me. If you answered “No! 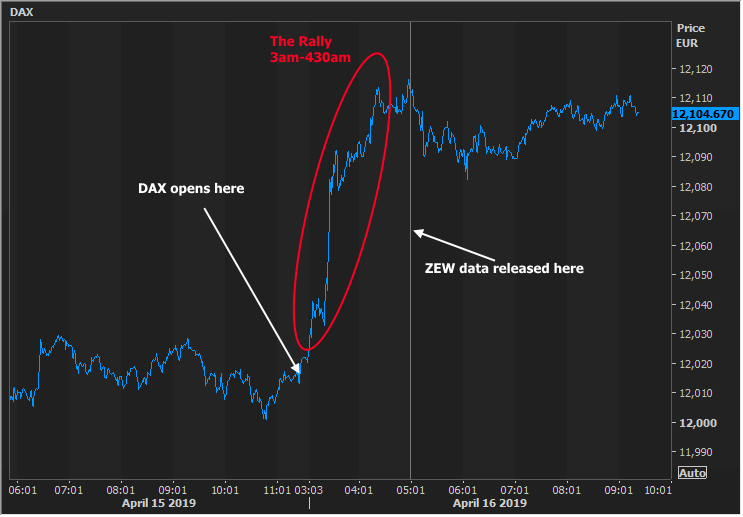 Not only does the rally obviously have nothing to do with the ZEW data, but in fact, German stocks FELL after the ZEW data was released. What the hell were they thinking? !” You’d be right! This is but one small, isolated example of financial market coverage that doesn’t take a moment to vet claims on a timeline. Believe me, it’s really easy to wake up in the morning, see two logically correlated things that happened overnight (i.e. higher stocks, stronger data) and scribble out quick piece that claims one caused the other. Those of us whose job it is to keep others up to speed on market movement tend to shy away from saying “I don’t know what’s causing this” for fear that it makes us look dumb. But that’s the whole point of this rant: it’s actually MORE dumb to make false claims even if they’re convenient and logical. What we’re left with is that frustratingly honest explanation of traders being traders. 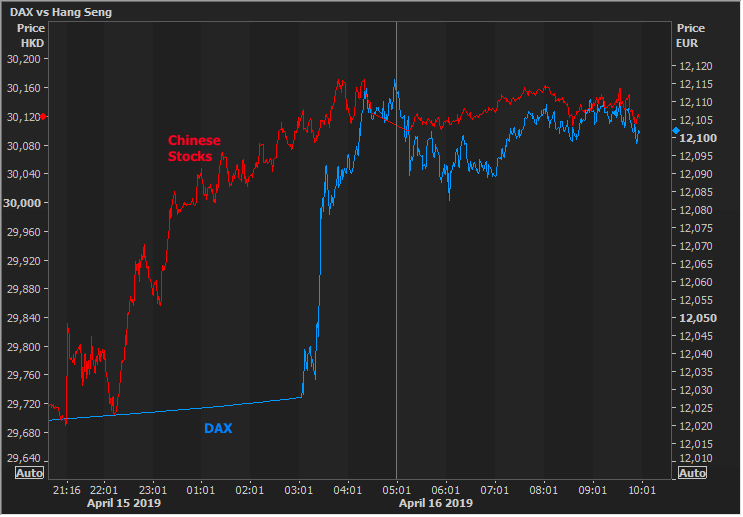 Please correct me if you know better (and yes, I’ve already checked on Zalando earnings/guidance and it doesn’t line up either, nor do the Donald Tusk EU/Brexit headlines). Sometimes traders are just on a pre-set course to make certain trades at the beginning of their trading day or shortly thereafter. We see this time and again at the 8:20am CME open in the US bond market or at 9:30am in the NYSE. We’ll often be left to guess as to motivations. When that happens, one of the only things we can do from an analytical standpoint is to take a step back and consider what’s going on in the bigger picture. On that note, I see global equities markets recovering after the big dip of late 2018. Bond yields were thinking about going with stocks before the January 30th Fed Announcement, but that kicked off a nice little 2 month sugar high for the bond market. 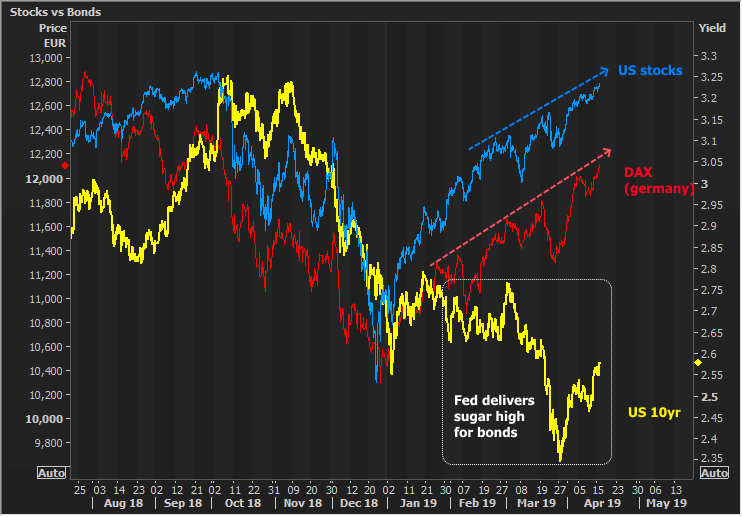 Perhaps it was a one-off adjustment and we’re now bound to see more correlation between stocks and bond yields? 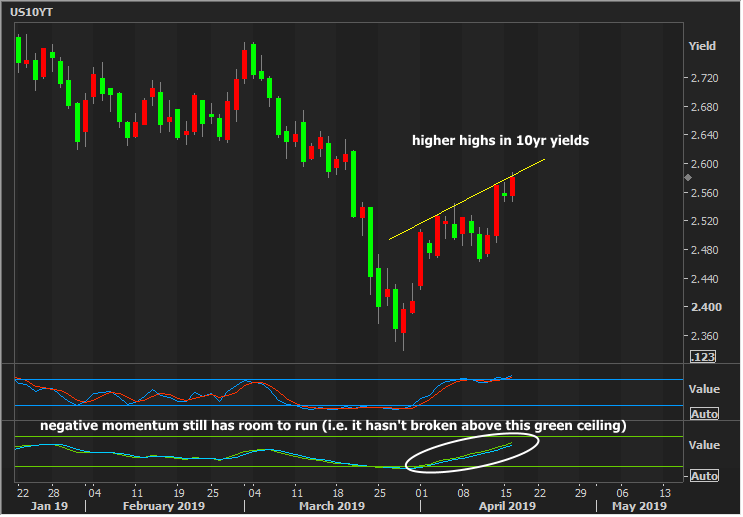 Either way, it’s important to note that today’s weakness perpetuates a trend of “higher highs” for bond yields. That trend is not your friend.